The generation of dust, fumes and gases is an inevitable part of most industrial processes. The consequences of these particles in suspension can be extremely dangerous for human health, in addition to generating a dirty work environment and polluting the environment. To avoid these risks it is essential to extract and confine the dust in suspension before they reach the breathing zone of the personnel and which negatively impact the environment. Some typical sources of contamination are the processes of cutting, grinding, blasting, as well as the handling of different types of dust in the food, mining and pharmaceutical industries. Textile, wood and compounding processes can also release dust and harmful fibers that can affect the respiratory tract and cause allergic reactions by penetrating the skin. In Cym Materiales SA we offer integral solutions in aspiration for the most diverse industrial processes that generate dust such as welding fumes, plasma cutting and fumes in general; cutting powder, grinding, sanding and powders in general; gases, oil mists and tin welding fumes, among many others. 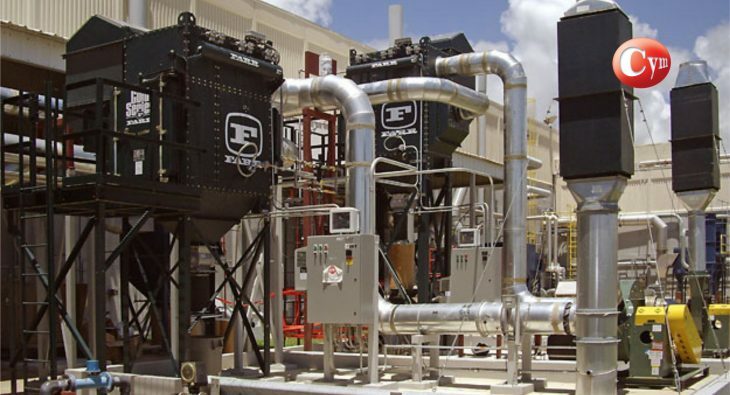 Our suction systems are adjusted to each need, and thanks to an exclusive design and applied know-how, they ensure an excellent level of particle retention with a low operating and investment cost, generating a clean and safe work environment. Dust colector are used to control environmental contamination and / or to recover industrial products applied to the most diverse industries.